We approached our task somewhat strategically and our plan involved us making the best use of the few hours we had left in Day One, build momentum with an early start the next day and end with a wild flurry down the stretch of Day Two. We would start with small, family-owned wineries at first, move to large wineries right after our breakfast at Tim’s in Day Two and finish with the medium-sized friendly wineries down the stretch…which would be crowned at the finish line with a hearty Italian dinner. Then, someone asked: “How many wineries do you suppose we could…” That’s a dare anyone one of us would welcome. Armed with our polished palates and, most importantly, our refined noses (after all, we know that without your nose, your palate tastes nothing). Having said that, we were resolved to keep our focus on quality, not quantity… but as much quality as we possibly could (while still being able to stand in the upright position, that is). With so much wine to taste and so little time, we set out upon our arrival to the smaller “family” wineries in Central Okanagan, just south of Kelowna. 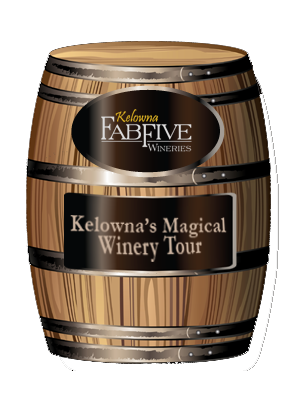 We took on the Kelowna Fab Five Wine Route and started with House of Rose Winery, Camelot Vineyards and Estate Winery, The Vibrant Vine Winery, Spierhead Winery, and The View Winery. We listened and sipped as the owners proudly explained how their vines are so advantageously situated so as to produce the unique flavor profile of their masterful blends. From spicy reds and the crisp and fresh tangy-ness of golden Rieslings to, for something totally different, the Distraction Frizzante made at The View Winery. Fabulous Five it was and this was perfect to round off Day One. Lovely little winery with a very welcoming tasting room. Their friendly staff was eager to help us taste their various award-winning wines including an appropriately named Cool Splash, a mix of Riesling and Pinot Gris, and their Sweet Mystery, a sweet red. While there, we learned that they were hosting a grape crushing event the next day. As much as we would have liked to partake, the rest of the wine route was calling. Try pulling Excalibur out of a rock while tasting some great wines from this Renaissance-themed tasting room. Their incredible White Knight Gewürztraminer and their Pinot Noir with strong aromas of raspberry, are perfect for sharing at your round table. Put on your 3-D glasses and prepare for one of the most unique wine tasting rooms and bottle décor you’ve ever seen. They make it a great experience for all the senses. Don’t take this winery too lightly, their bottle of “OOPS!”, a Gewürztraminer, was the winner of the “Best Wine in The World” at the 2014 World Beverage Competition in 2014. A must see when in the Okanagan. Unfortunately we did not make it in time to visit this winery before they closed for the evening. This is the largest of the Fab Five. The people over at The View are a very busy bunch. They have excellent whites, rosés and reds, but what really sets them apart from other wineries are the Bling Sparkling Wine and Bling Pink Sparkling Wine. A must try when visiting. This entry was posted in Home and tagged food and wine, Kelowna, Okanagan wine, Wine, wine country, wine tour, wines of bc, wines of canada.